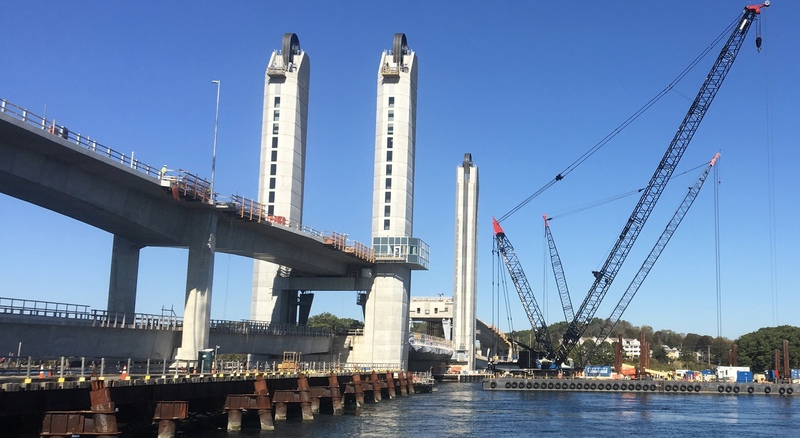 The design process began in 2013 for this 30 month project consisting of the removal and replacement of the Sarah Mildred Long Bridge (SML), spanning the Piscataqua River between Portsmouth and Kittery. Over 30,000 cubic yards were placed, including the 88 precast segments making up the bridges iconic towers. The 3 million pound center lift span is the last major concrete phase of the project, which includes lightweight concrete on the lift span. SML includes mix designs based on Maine DOT specifications. SML will undoubtedly become the new landmark of the Seacoast region. With a larger 56’ vertical clearance in its “resting” position, there will be 68% fewer bridge openings. The 200’ tall precast concrete towers will support the 300’ long concrete filled structural steel box girder lift span. The new bridge layout uses 11 fewer piers than the old bridge, improving the gateway span leading into downtown Portsmouth by eliminating a median pier. Most importantly, Cianbro and Redimix delivered safety, recording only one minor injury for the project in tens of thousands of man hours. Concrete placements started in 2015 and completed in late winter/spring of 2018. The bridge opened for traffic March 30, 2018.